As Electric Vehicle (EV) uptake accelerates and costs fall, more and more companies are exploring how to electrify their vehicle fleets and offer EV charging to employees and/or customers. Delivering sustainable transport solutions will cut carbon and improve air quality, but businesses need to think carefully about the impact on their electricity demand and how they manage EV charging as part of their wider energy strategy. Dagoberto Cedillos, Strategy & Innovation Lead at Open Energi, explores five factors every business should consider, and how, with the right approach, EVs can be managed to deliver valuable savings and income. There are a large and growing number of EV models on the market with progressively faster charging speeds and bigger ranges. Charging set-ups differ across manufacturers, although two favoured options seem to be emerging; Type 1 and CHAdeMO or Type 2 and CCS (Zap Map offer a good overview of this). In the UK Type 2 is by far the most commonly available chargepoint. 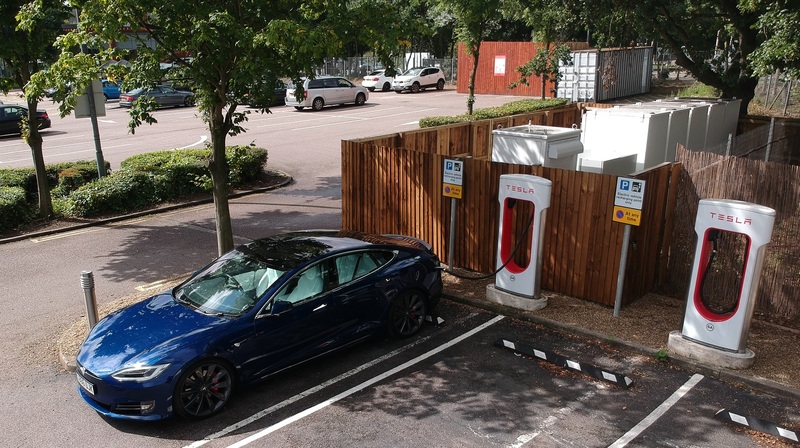 Understanding fleet or workplace/customer charging requirements should inform what charging infrastructure is most appropriate, but of course fast or rapid connectors will have a larger impact in terms of electricity demand. EVs can instantly draw a lot of power from the grid. Today’s rapid chargers typically charge at up to 50kW (although Tesla’s are faster), but newer models are expected to charge at 150kW and beyond. If you are offering fast/rapid charging and expect to have many vehicles charging at once, you may need to expand your connection size. A larger connection will cost more but will enable you to meet higher demand without exceeding your import limits – assuming the local electricity network has the capacity. An alternative approach is to stagger the timing of vehicle charging so that you avoid creating a surge in power demand (‘smart queuing’), enabling a smaller, less expensive connection. Similarly, if you have on-site renewable generation or energy storage, these can be used alongside EV charging to manage demand and make the most of clean, cheap electricity when it is available. It’s really important to think about expected charging patterns. If it’s your own fleet will they all be charging overnight only, weekdays versus weekends, or on a rolling 24/7 basis? Similarly for employees or customer charging facilities, will charging be condensed into working or opening hours or could the facilities be used more widely? The more flexibility you have to manage and spread EV charging the better, but you have to start by focusing on the requirements and expectations of the driver. A supermarket customer might only connect for twenty minutes but won’t want their charging interrupted. Someone at work could plug their vehicle in for eight hours or more, so probably won’t mind if you delay or interrupt their charging as long as their vehicle is charged and ready to go when they finish work. Smart queuing, which automates optimal queuing and charge dispatch of EVs can manage this process to support local network needs and ensure vehicle charging is prioritised in the appropriate order. If charging stations are dispersed in small numbers across multiple sites that will be much easier to manage and integrate with existing infrastructure than a large number all at one site. However, if your charging is concentrated in one place, this will make it easier to capture value from smart charging and EV flexibility. Local flexibility markets are emerging, and the ability to turn-down demand quickly and efficiently could provide a valuable service to local Distribution Network Operators. 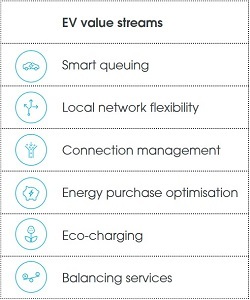 The business case for aggregating and delivering this kind of service from EVs becomes more compelling where there are economies of scale to be gained from connecting to many vehicles in one place. 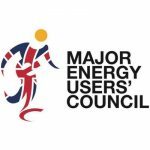 It’s important to assess the impact EVs will have on your electricity bill. Understanding this, and the nature of the tariff structure you have with your supplier, will help to identify where the opportunities for optimisation lie. Minimising charging during peak price periods and maximising charging when electricity is at its cheapest is an obvious first step, but the ability to manage the timing of EV charging also opens up potential revenue streams. For example, as renewable generation grows instances of negative pricing – when you get paid to consume electricity – are expected to occur more often. With the right technology in place, your EVs could respond to these price signals and get paid to charge your EV fleet. More generally, the ability to respond to fluctuations in electricity supply and demand and provide short-term balancing services – i.e. a few minutes – to the System Operator can be extremely valuable. If you have any questions or would like to discuss your business’ EV charging strategy in more detail, please get in touch.